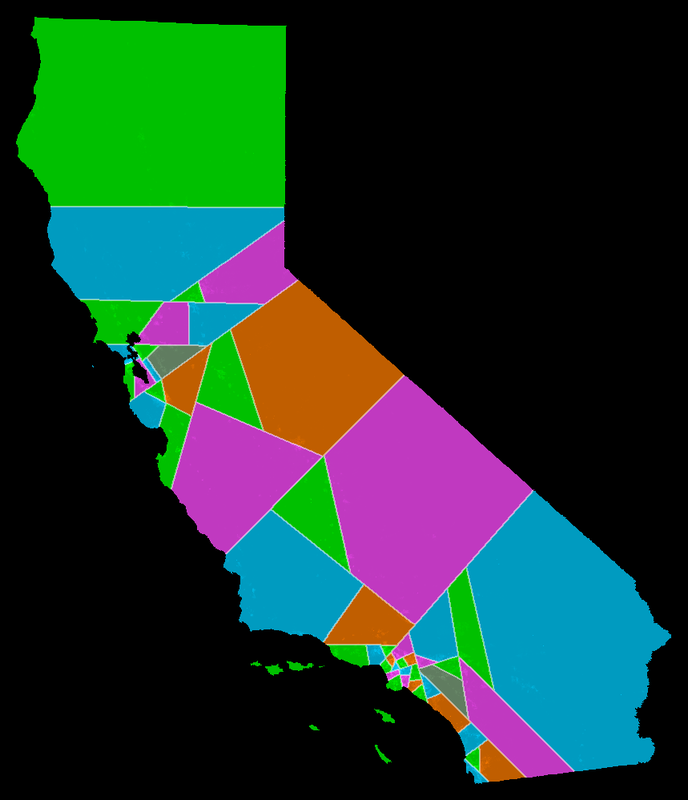 Nick requested to see CA districting under the shortest splitline algorithm. This entry was posted in algorithmic_redistricting, gerrymandering, shortest_splitline. Bookmark the permalink. Hmmm, interesting layout. Even though there are alot of areas in california that aren’t developed, what would happen if each district was exactly the same size??? Districted approaches can be used in several ways. Most important political bodies in the US use reps of type ‘A1’. Some other countries use ‘B1′ in which there is one or more districts from which multiple winners are selected in a way that attempts to be proportional to the populations’ views. One could imagine choosing reps from equal sized (but with varying population) districts by using strategies B1, B2, or A2.